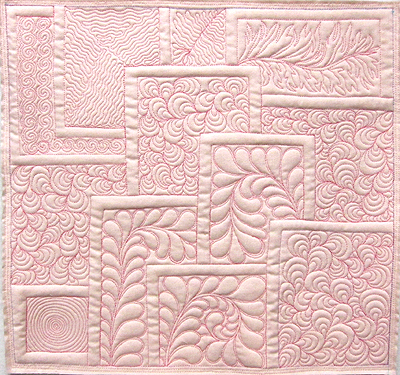 My Free-Motion Quilting Challenge Trapunto Tutorial is available! 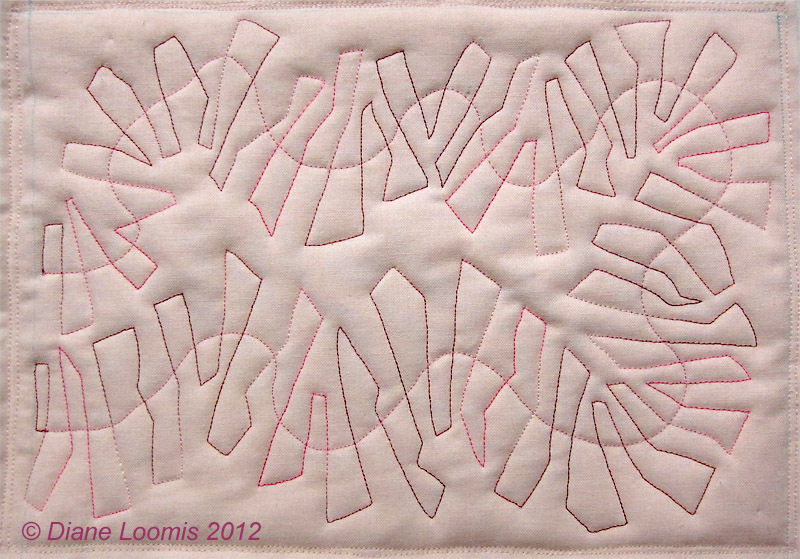 My guest tutorial for SewCalGal’s 2012 FMQ Challenge is online today!! The tutorial is on one of my favorite techniques, machine trapunto. I hope you will enjoy and learn from the tutorial as much as I have – I enjoyed writing it, and learned from the process as well! I’m happy to answer any questions you have, either on SewCalGal’s FMQ Challenge blog, the 2012 FMQ Challenge Facebook group, or here. I’m always trying to photograph trapunto from the side so you can see the depth and dimension this technique creates on quilts. 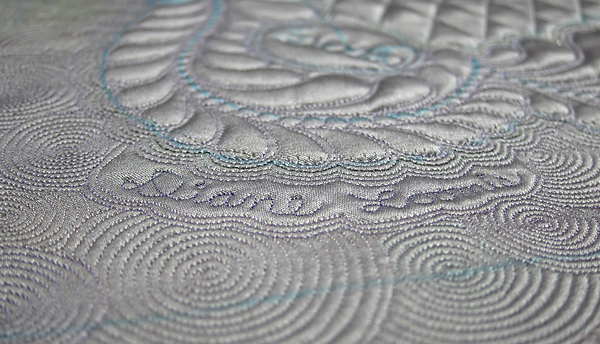 I’m not sure I caught the depth, but can you see the different colors of silk thread in the echo quilting? I’m not sure you can tell, but one echo quilting line uses YLI’s ‘Silk Sparkle’ thread (next time I’ll use a lighter color for more contrast). The Silk Sparkle is #100 silk thread twisted with metallic; it is a very lightweight thread that blends beautifully with the rest of the silk quilting and adds a subtle sparkle to the top. I was thrilled when SewCalGal asked me to be one of her FMQ Experts and offer a Bonus Tutorial for the FMQ Challenge this year! I’m even more excited that it’s just about done and will be available next week. Be sure to check out the 2012 FMQ Challenge page next week. 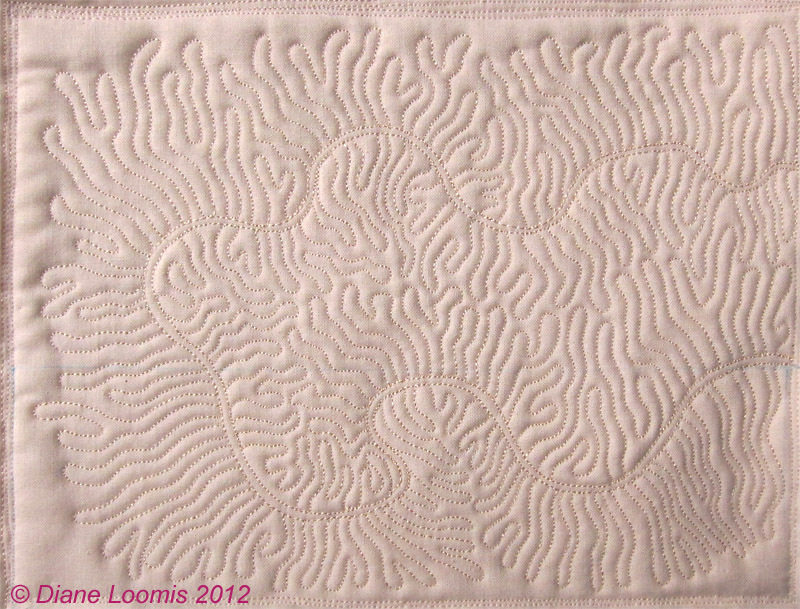 I have read and quilted most of the FMQ tutorials this year … (although I haven’t managed to post photos every month. One of the things I really like is the variety of FMQ Experts and tutorials. (I will admit) I have been reluctant to try out some of the tutorials that have not been in my ‘comfort zone’ of machine quilting. But I have been really pleased every time I do! So, here’s my take on the May FMQ tutorial by Leah Day. Before stitching the second sample I wanted to come up a different way to use stipple quilting in Leah’s tutorial (I admit it: I don’t like traditional stipple quilting). I finally remembered experimenting with these wiggly lines that look like ‘linear’ stippling. 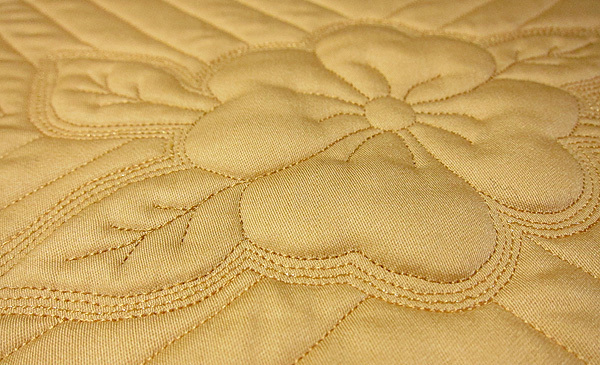 I used a trilobal polyester thread on the quilt top with the same cotton thread in the bobbin. This created a subtle texture on the front that I really like! I love SewCalGal’s July FMQ challenge and the Tiles design Angela Walters shared with us. The Tiles motif includes one of my favorite free motion techniques, stitching straight lines with a free motion quilting foot. And even better, you get to quilt up, down, left, and right! 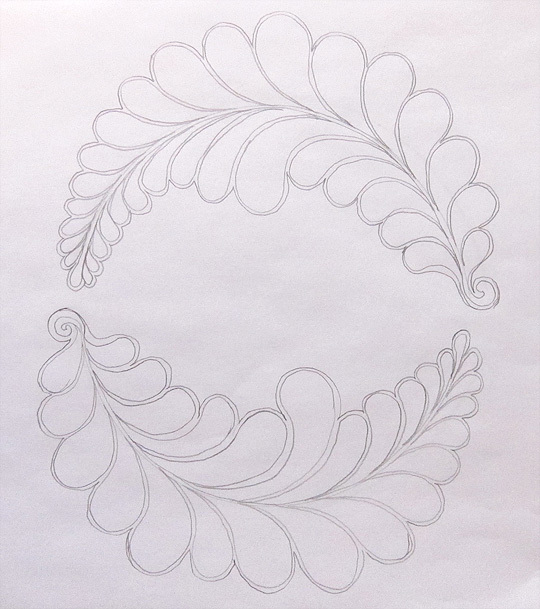 Because the Tile lines are not too long, they are a great opportunity to practice straight line free motion quilting. I can imagine many more ways to use this structured yet flexible technique, to quilt both large and small spaces. I quilted a small sample to test the pattern first. The top fabric is pink Kona cotton solid, layered with cotton batting, and muslin backing. The cotton batting is different from the wool batting I usually use, and results in a lower loft / flatter look and feel to the quilting. I used slightly contrasting thread [still #100 silk) and this combination worked nicely for the Tile practice sandwiches. I was excited to get started on a larger quilted sample. 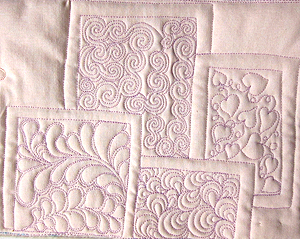 I changed thread colors from the lavender to dark pink, and started quilting away. At first I used the same design in each ‘Tile’ rectangle because I wasn’t happy with the way the different motifs in each tile looked in my test sample. After filling a few tiles with feathers, I decided to try one – or two – more different fill patterns – but I repeated the fill in more than one tile (mostly…). I finally finished binding my feather plume sample from the February FMQ Challenge tutorial by Diane Gaudynski. 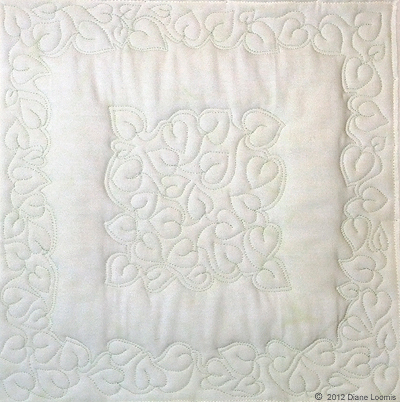 (I highly recommend you read through Diane’s tutorial at least once – it is packed with excellent instruction and advice on free motion quilting.) I call the sampler ‘Rogue Feathers’ – my friend Jenny named the little feathers at the bottom ‘rogue feathers’, surrounding the circle. I quilted the feathers there because I couldn’t bear echo quilting any more! I am pleased with my little silver sampler. One of the reasons I love this fabric is the way it subtly changes to the shade of the silk thread used for free motion quilting. I’m having trouble showing this in photographs, so here’s another view that shows the color changes in a different light. 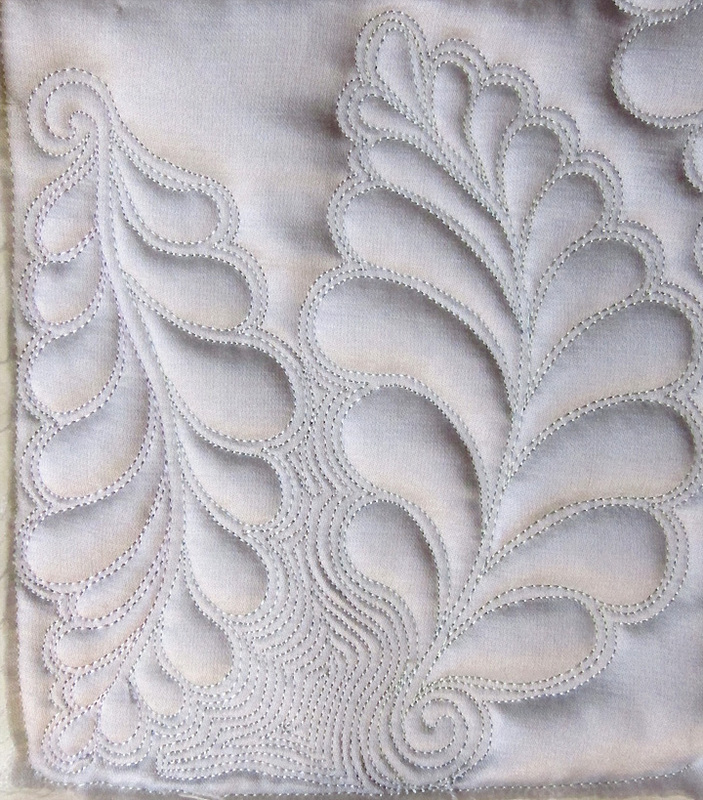 2012 is the 25th anniversary of the New England Quilt Museum and in honor of this silver anniversary the Museum has issued a ‘Silver Threads Quilt Challenge’. The challenge is to create a quilt inspired by the word ‘silver’, and I had a project in mind using this beautiful silver fabric before I discovered the challenge. 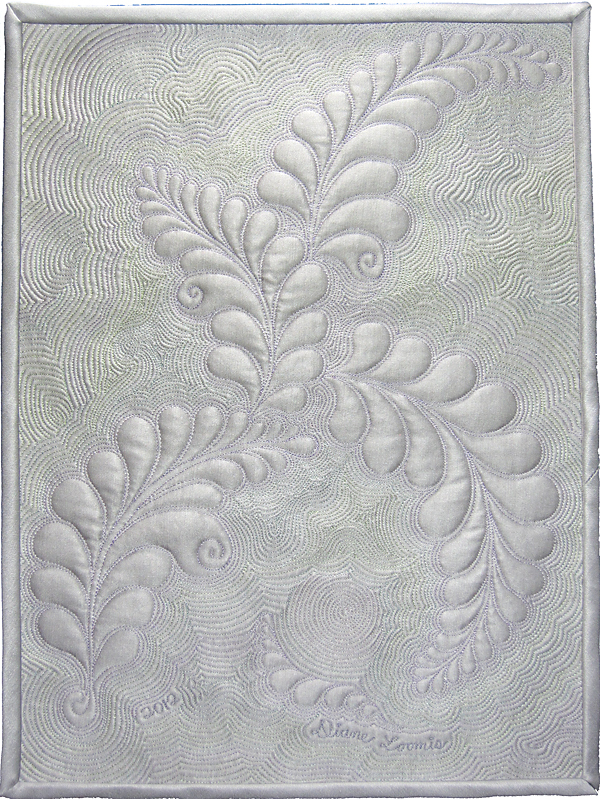 I just finished machine quilting my silver-inspired quilt, so it is ready to be blocked, bound, and finished. The bright blue is from the water soluble blue marker that I use to mark my quilts (the blue markings are already gone since the quilt’s first immersion today in clean, cool water.) The quilts will be on display at a special exhibit at the 2012 Lowell Quilt Festival from August 9-11. From another perspective you can see my signature as well as my favorite circle-spirals. Want to see the finished quilt? Mark your calendar to visit the Lowell Quilt Festival, Thursday August 9 – Saturday August 11. Visit the Lowell Quilt Festival website for more information about activities, lectures, and exhibits. I couldn’t stop myself from quilting once I began free motion quilting the feather plumes from last month’s challenge. The fabric is solid silver, silk/cotton sateen. Using different colors of silk thread (all #100, both YLI and Superior depending on the color) made it look like the fabric was hand dyed (although this photograph may not do justice to it). 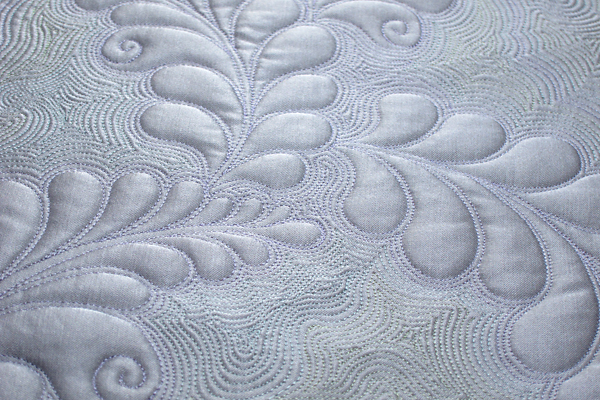 I liked the pale lavender thread on the silver sateen best and used it to stitch the feather plumes and the first few rows of echo quilting around them. When I finished quilting the sampler, the fabric around the feathers looked lavender, instead of silver. My second favorite color on the silver sateen was pale blue (different shades) but the contrast of the light green silk thread really added movement to the background. Confession #1: Wow! I can’t believe I’m posting this again just under the wire. The 2012 FMQ Challenge is really providing me with a deadline and motivation to keep up with at least monthly blog posts (even though they may be written late at night). Confession #2: I took my first workshop with Diane Gaudynski in 2004, and I learned to quilt feathers from her then. 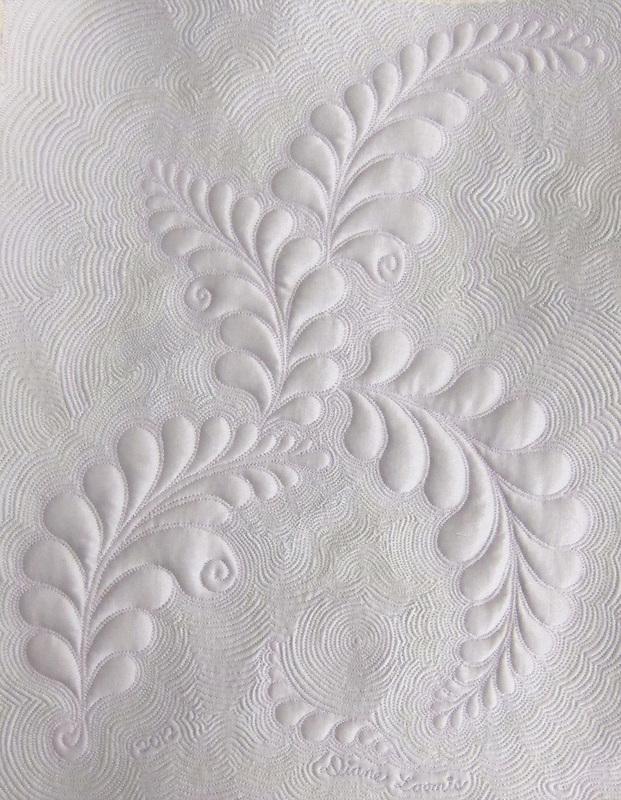 I have quilted feathers for many years … they are one of my favorite things to quilt! As I read Diane’s excellent February tutorial, I looked for something new to learn from this lesson. I noticed that Diane’s feathers all flow beautifully into smaller and more delicate feathers into a graceful end of the plume. When I looked at my feathers, I saw that I tend to end my feathers with a larger feather, or loop, at the end. So I decided my challenge for the month was to try to taper my feather plumes to be smaller at the end. I began drawing feathers, early this month. I discovered changing my habitual ways of drawing (and stitiching) feathers was more difficult than I expected! This was my first drawing. I wasn’t very happy with the result. It didn’t flow and didn’t feel balanced. I definitely had trouble making the ends of the feathers small and graceful. Diane posted a blog entry on ‘Feather Plumes Linked‘ earlier this month. I loved the idea and tried it with paper and pencil. I like these linked feather plumes alot! I tried to create a type of circular ‘focal point’. You could use two or three plumes, instead of a continuous circular wreath. Imagine a special shape, motif, or monogram inside the two rounded plumes…. Yes, I quilted some feather plumes also. But first I wanted to test different thread colors of silk thread for use on this wonderful silver silk sateen fabric that changes color in different light. 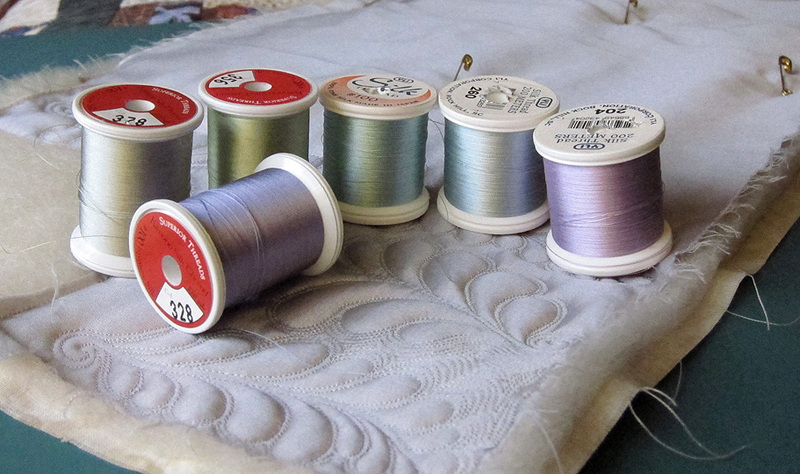 I used each of these threads to stitch some sample feathers. My favorite color was the pale lavender for these sample feathers. I used lavender, light blue, light green, and some silver thread in this sample. Although it takes a little longer to switch spools, I really like the movement and dimension that different thread colors add. Here is my final [for now] feathered plume for February. I am pleased with it — but there is so much unquilted space! I had to add some more quilting to the empty space. So the design evolves…. I’ll post a photo or two of the finished sampler soon! To encourage myself to re-start blogging this year, and to challenge myself to practice new free motion quilting techniques, I ‘took the pledge’ to participate in the 2012 Free-Motion Quilting Challenge. Check out this challenge at SewCalGal’s blog — especially the list of talented machine quilters (all home sewing machine quilters!) who have volunteered their expertise. Every month a different tutorial will be available at for the 2012 FMQ Challenge. I’m looking forward to the different tutorials, especially those that will be out of my ‘comfort zone’. It’s good to stretch, and I believe we never stop learning, and there’s always room for a new idea, insight, or tip. 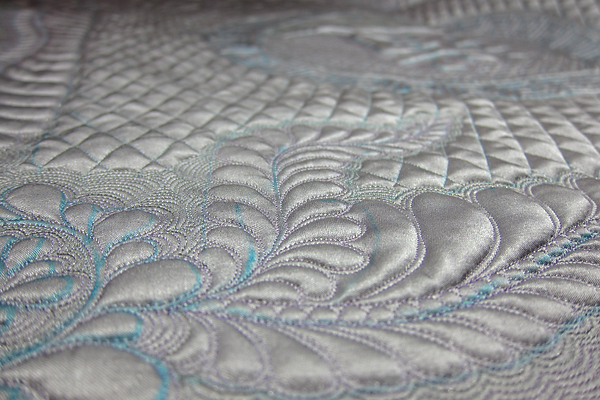 The leaves are quilted with pale green silk thread (of course!) on a quilt sample sandwiched with cotton batting. I tried a sample with wool batting but there was way too much ‘pouf’ in the open area for the 8″ square. 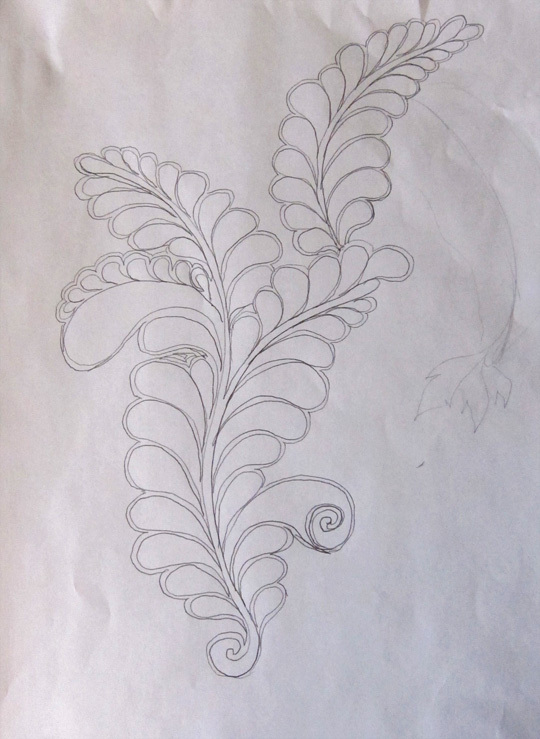 My variation of this motif adds the echoed outline around the center square of leaves, and around the inside of the leaf border. Next month’s tutorial (probably ‘this month’ eg February by the time you read this) – not to be missed – is by Diane Gaudynski. 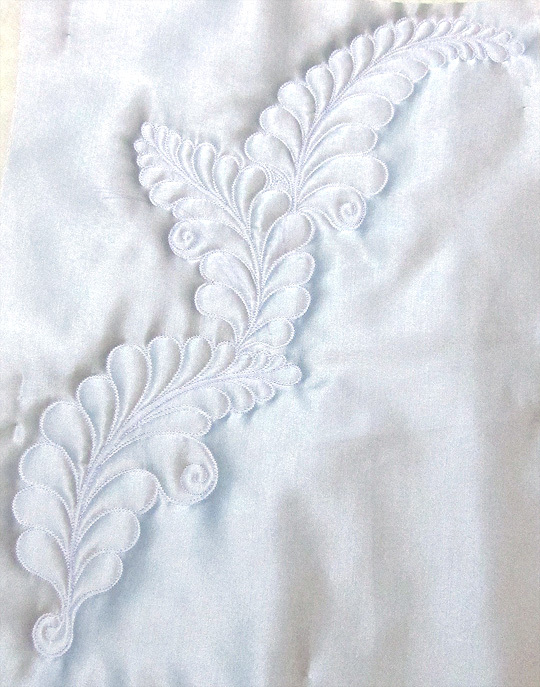 Visit Diane’s blog for previews of her February tutorial explaining how to quilt a feather plume.